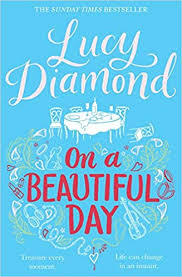 It has been a while since I have read a book by Lucy Diamond but I read the synopsis for On a Beautiful Day and it sounded like the type of storyline I felt like reading about friendships and life choices and evaluations. The storyline begins with our four main characters, Laura, Eve, Jo and India, who are incredibly close friends who have all met up for a birthday lunch but whilst they were enjoying themselves and getting merry they witnessed a tragic accident over the road from where they sat. The women visibly shaken from the event soon realise this is a wake up call for them and begin to see their lives differently. I made the right choice in choosing this book to read. I connected with the characters and the storyline so much with events they were facing it was rather eerie for me! Each of the women have a battle they are facing and most readers will connect with one of the storylines but your heart also goes out to the other women’s troubles too. Personally, I did find it took me a long time to differentiate between the characters, trying to work out who was who and which battle they were facing. Each chapter was told from one of the women’s points of view so we get to find out some very emotional situations the women are facing or have faced, some of which they have kept to themselves unable to bring themselves to share their feelings and experiences with anyone and this book certainly shows us that talking and sharing is a big step to healing. What I loved most about this book is the friendship between the women, there are not enough books out there for me that features an incredible strong and natural friendship between normal day to day women like this. There were a lot of sensitive topics that were involved in this storyline from serious health situations to relationship troubles and fertility just to name a few and each and every situation was handled with such care whilst bringing awareness to the topics at the same time. This book will have you engrossed right up to the very last page and you end up feeling like one of the group so it is with regret you leave the women behind at the end after haring laughs and tears along the way with them. It is certainly one of those books that make you stop and re-evaluate your life as you never do know what is around the corner.